Eamin Haque Bobby is a Bangladeshi well-known and beautiful film actress. Bobby has got much popularity around the country for her nice looking appearance in the silver screen. She is the actress of Dhallywood film industry who came to the limelight with the movie Dehorokkhi in 2013. 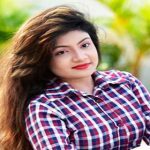 Nowadays, she is the most demandable actress in the Dhallywood film industry for her magnificent performance in the showbiz arena. Furthermore, she is one of the most popular female actresses in Bangladesh. Eamin Haque Bobby was born on August 18, 1987, in Dhaka, Bangladesh to father K M Enamul Haque and mother Viqarunnesa Haque. She was raised in Dhaka, Bangladesh. Bobby was very much interested in showbiz arena from her early childhood. She attended in Monipur High School and completed Secondary School Certificate (SSC) from this school. Then she admitted Adamjee Cantonment College and completed her Higher Secondary Certificate (HSC). Bobby enrolled in Eastern University, Dhaka and received her degree in Bachelor of Business Administration (BBA). Bobby is one of the highest educated film actresses in the history of Dhallywood film industry. Eamin Haque Bobby is a Bangladeshi nice-looking film actress who started a career with the modeling in showbiz arena. Bobby made her debut in the Dhallywood film industry with the movie Khoj: The Search IN 2010. Then, she came to timeline within a very short time for acting in movie Dehorokkhi directed by Iftakar Chowdhury that was released in 2013. The movie hit the box office. In the same year, she acted in the movie Full and Final with co-actor Shakib Khan. Then, Bobby acted in the Bangladeshi booming film, Inchi Inchi Prem with co-actor Bappy Chowdhury. In 2015, she showed her terrific performance in the movie Blackmail. you are very very cool…?